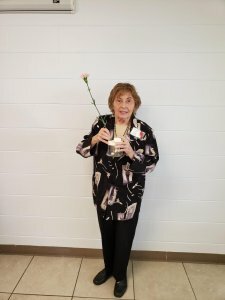 Vicki Hearst, Horticulturist Extraordinaire, was Clermont Garden Club’s guest speaker Wednesday, April 17, 2019. 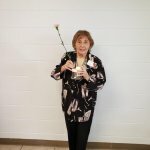 Vicki is an active member of Windermere Garden Club and is President, elect for the coming year. 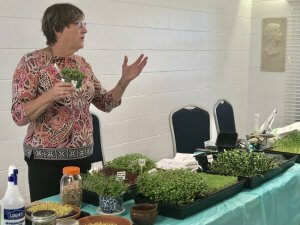 Vicki educated the members on how easy it is to grow INDOOR EDIBLES. 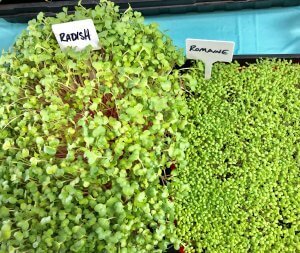 Shoots – Peas, Sunflower, and Wheat Grass are called Microgreens and shoots. 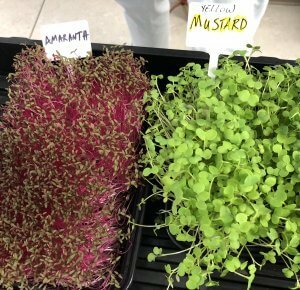 Baby Greens – Young “salad” plants, usually a mixed variety, grown in potting mix, past the 2nd leaf stage, and harvested by trimming the leaves as needed. Vicki’s presentation was interesting and very educational. 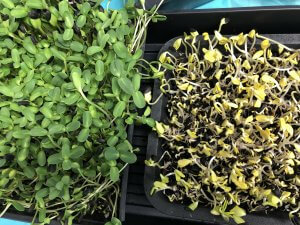 Members were excited to take home seeds and potting soil to start growing their own Microgreens. 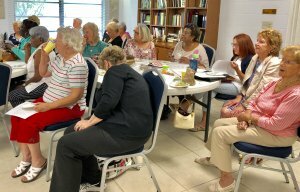 Clermont Garden Club members meet every third Wednesday of the month, (September- May) at the clubhouse, 849 West Avenue, Clermont, Florida 34711. 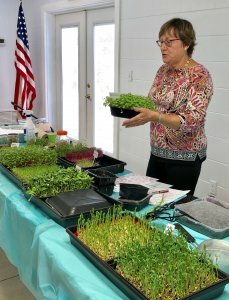 Meeting begin at 10 A.M.
Clermont Garden Club’s Annual Luncheon is scheduled for the May meeting. New members and guests are warmly welcomed to the general meetings. 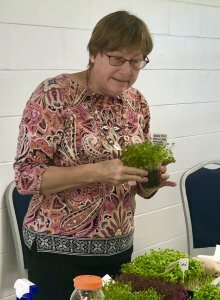 Chickie Broman, Clermont Garden Club member and Designer Extraordinaire, will present “Leaf Manipulation. 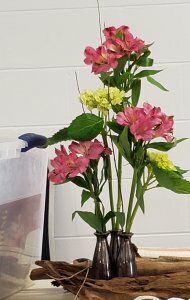 ” Chickie will demonstrate various techniques to add intrest to floral designs. 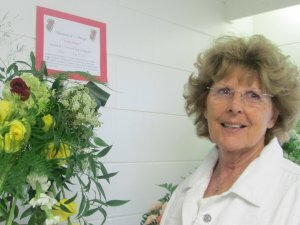 Chickie has been designing floral designs for many years and have the Blue Ribbons as her receipts. The program begins at 10 A.M. and is FREE and open to the public. 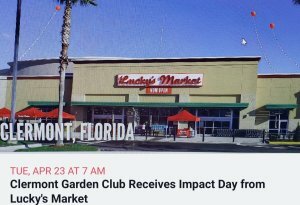 Clermont Garden Club is located at 849 West Avenue, Clermont, Florida 34711. 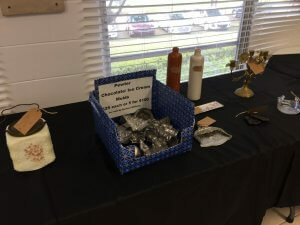 Clermont Garden Club’s Antiques/Collectables Appraisal Fair, March 30, 2019, had a terrific turnout. 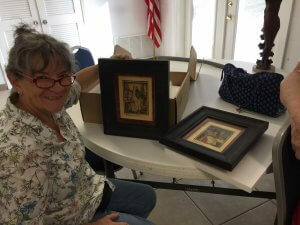 Individuals streamed in, from all over Central Florida, to present their heirlooms to appraisers. 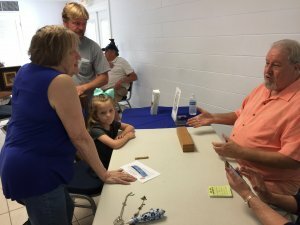 Would their precious heirloom be a piece of treasure or a piece of junk? 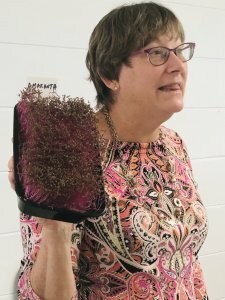 Carolyn, a FFGC Flower Judge and Floral Designer for over 40 years, explained floral design techniques. She also demonstrated how to use the various tools and materials necessary for creating a great design. 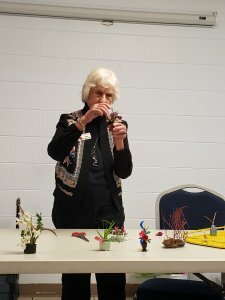 Next, Anne, a FFGC Flower Judge and floral designer for many years, showed the audience how to construct miniature floral designs. 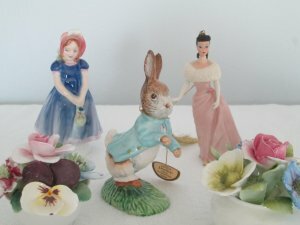 Miniatures can be up to 12″ high. 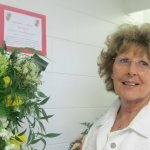 Lastly, Julie, who has earned the reputation of an expert floral designer, due to her many blue ribbons in floral design, created two gorgeous floral designs. 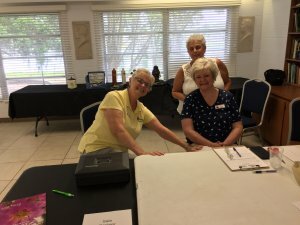 Carolyn, Anne, and Julie presented a fun program that was loaded with interesting information. 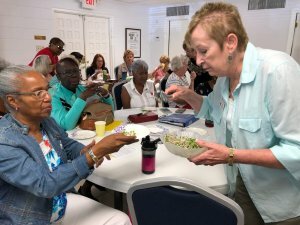 Clermont Garden Club members meet every third Wednesday of the month, (September – May) at the clubhouse, 849 West Avenue, Clermont, Florida 34711. 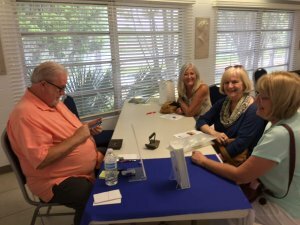 Meetings begin at 10:00 A.M. New members and guests are warmly welcomed. 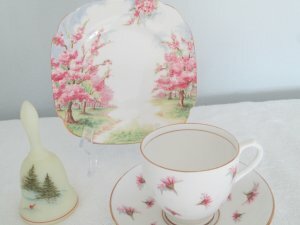 On Saturday, March 30th, from 9am – 1 pm, the Clermont Garden Club will be hosting an Antique & Collectibles sale. Clermont Garden Club selected the beautiful home of Joanne and Paul Cappolla at 12134 Lake Valley Drive in the Oak Valley neighborhood. 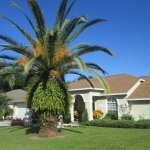 The front yard is filled with beautifully groomed bougainvillea’s, a lovely variety of palms, blooming trailing vinca’s, colorful crotons, native coonties, and so much more. 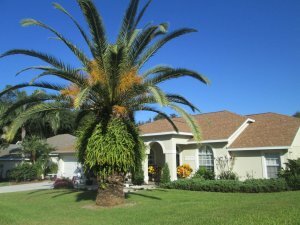 The side and backyard are xeriscaped with more palms, blooming tropical plants, and even a real cotton bush. 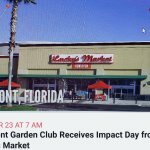 For more information about the Clermont Garden Club (activities, membership, and clubhouse rental) go to http://www.ClermontGardenClub.com. 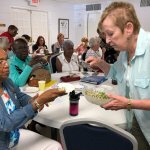 Clermont Garden Club meets every other Wednesday, (September- May) at the clubhouse, 849 West Avenue, Clermont, Florida 34711. Meetings begin at 10:00 A.M. New members and guests are warmly welcomed. 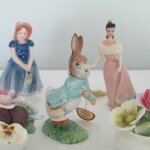 On Saturday, March 30th, from 9 a.m. – 1 p.m., Clermont Garden Club will be holding an event for you to obtain appraisals of your antiques and collectibles as well as try to sell any small antiques or collectibles that you may wish to bring that day. Appraisals will be provided verbally for $5 per item (no large items, furniture, coins or weapons). 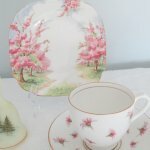 Items to be sold will be consigned to Clermont Garden Club for the day and CGC will retain a commission of 30% if the item is sold. 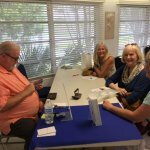 For questions regarding the Antique Appraisal and Sale at Clermont Garden Club, 849 West Avenue, please email Marilyn Paone (m.paone@icloud.com). 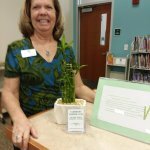 Candace Keller-Raber, a staff member of the Cooper Memorial Library is shown here with a “Lucky Bamboo” (Dracaena sanderiana) brought into the library by Barbara Williams, a member of the Clermont Garden Club. While it is not a true bamboo, this Lucky Bamboo looks like one and is very easy to care for! It is an indoor house plant, and it should be kept out of direct sunlight. Water just once a week. It’s a great plant for beginning gardeners. It is believed that keeping lucky bamboo inside houses and business places promotes happiness and prosperity. 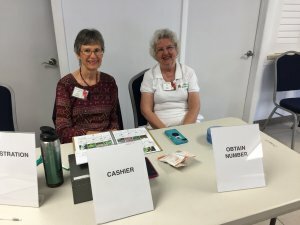 Each month, a member of Clermont Garden Club shares a plant with Cooper Memorial Library to introduce Clermont residents and surroundings areas to a variety of horticulture, promote interest in Clermont Garden Club, plus promote a love of gardening. 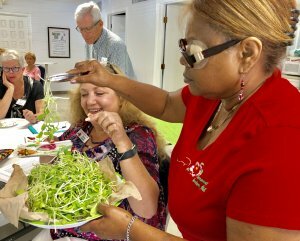 Clermont Garden Club members meet every third Wednesday of the month, at the clubhouse, 849 West Avenue, Clermont, Florida 34711. Meetings begin at 10:00 A.M. New members and guests are warmly welcomed. 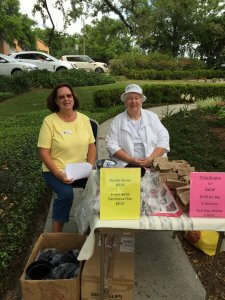 Clermont Garden Club is a 501(c)3 non – profit organization.